As Halloween welcomed the world’s seven billionth person, there has been renewed interest in meeting the food, shelter, and water needs of a large and growing global population. One recent article in the Washington Post (10/30/11) attempted to make 7 billion a tangible number that kids can wrap their minds around by describing 7 billion M&M’s filling three Olympic-sized swimming pools. 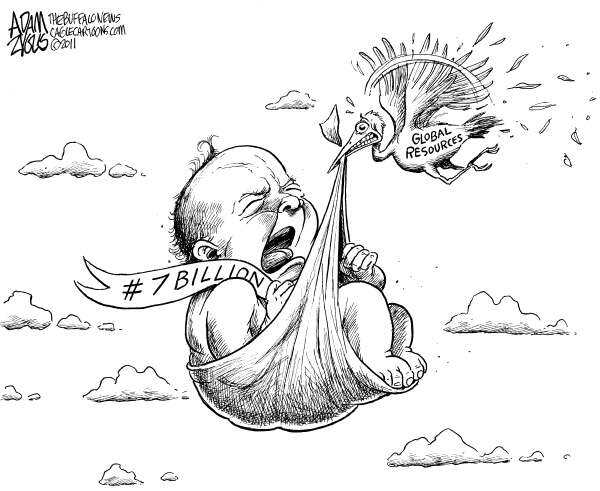 While I think this is a useful exercise, when thinking about 7 billion people, not all people can be counted equally. In terms of resource use, each of the over 300 million United States citizens are like bloated, entitled M&M’s squeezing their smaller brethren out of the pool. I remember the professor of my first demography class beginning her lecture on resource use with a fact – the average American born today will use 125 times more resources than the average Indonesian. While there are less American babies joining the world, their overall impact is still orders of magnitude higher than their Indonesian cohort. Resource use, then, is less a question of population and more about individual footprints. Even if it were about sheer numbers, the world’s fertility has fallen dramatically and our growth will soon cease, if not reverse. Most countries have fallen below replacement (~2.2 children per woman) and those that haven’t still have high mortality from AIDS so that roughly 2 survive to adulthood. The question of population and resources is age-old. Thomas Malthus, widely known for his theories of population, first warned of impending doom in 1798 when he described the geometric growth of human population on the path to surpass the arithmetic growth of food. In his day, increasing yield and new cultivation of land could not keep up with the population boom occurring in his home country, England. By the fourth edition of his book in 1826, however, public response to his theory forced Malthus to add an important variable in the equation – technology. Humans were believed to be above the ecological dynamics of other species because of intelligence to be cognizant of resource use – and consequently adapt to scarcity with solutions and efficiency. The argument today doesn’t seem that different, though we have the benefit of observing England’s growth since Malthus’ predictions. The English have in fact created enough resources to support their people and population has leveled off at a new equilibrium. They have provided for the citizenry through better agricultural technology and global trading enabling farmers to grow things where they grow best. Malthus’ prediction of starvation and disease was averted largely by the Green Revolution. Over a century after Malthus, the Green Revolution took advantage of hybrid seeds, advanced irrigation technologies, new pesticides, and synthetic fertilizers to double yield in standard cereal crops. Recently, scholars recognize numerous negative side-effects of the Green Revolution while yields have plateaued. Because of this, neo-Malthusians claim that his original predictions have not been averted, simply postponed. Perhaps the most famous of this crowd is Paul Ehrlich, who published the Population Bomb in 1968 and has spent the next half century speaking on the ecological reasons humans are living beyond their carrying capacity on earth. To him and others, reducing population is the only way to bring humans back in line with the resources the earth can provide. To the more optimistic among us, why can’t a second Green Revolution occur? One based more in culture than in technology? Amartya Sen, Harvard professor of geography, has documented in numerous cases that hunger in certain regions is caused by geopolitical limitations rather than true famine. For example, it may be more about distribution than about production. There’s arable land not in production in many parts of the world, such as parts of eastern Africa, due to warfare and personal security issues. There’s also abundant land in production for animal feed and fuel production – not direct human consumption. Concentrated efforts on peace and global food distribution could deliver food to many of the hungry without new technological developments. The Green Revolution and technology discourse generally circles around food production because food is perhaps the most visible example of need, made apparent by demands for world food aid and television portrayals of starving children. However, the population problem will also place demands on shelter and water needs. Water is intricately tied to agricultural irrigation demands and requires a whole separate discussion from this one – but both shelter and water will depend on better land use planning to protect clean freshwater sources and minimize the resource demands of housing and commuting. This means focusing on both rural and urban development, making sure they complement each other and provide for the needs of the community at large. Again, this is not a technological issue but a planning issue. In short, technology doesn’t have to be our savior as the seven billionth person enters the world. A global awakening to the finite resources our planet holds can shift priorities and planning to a more frugal resource market. Such long-term planning offers a system solution rather than a technological band-aid. The second “Green Revolution” can rest instead on finding an ecological ethics base rather than technological solutions, making the most of what we have already. Great post. Keep the message going. If people realize that we need to use resources more efficiently, won’t that lead to improved technology to help accomplish this goal? Yes it will – I’m not saying that we won’t need technology at all but that changes we make will enable us to use less/conserve more rather than prolong our current lifestyles unchanged.